Laboratoire JOLIOT-CURIE - Chromatin and Retroviral Integration. Project leader : Marc Lavigne. Accueil du site > Thèmes de recherche > Chromatin and Retroviral Integration. Project leader : Marc Lavigne. Retroviral replication requires the integration of a cDNA copy of the viral RNA genome into the host genome. This critical step is performed by a viral-encoded enzyme, called integrase. In the case of HIV-1, this enzyme is a new and attractive target for anti-viral therapeutics and several integrase inhibitors are currently undergoing clinical trials. However, viruses resistant to these inhibitors have already emerged and novel integrase targets need to be identified, such as its selectivity towards cellular chromatin. 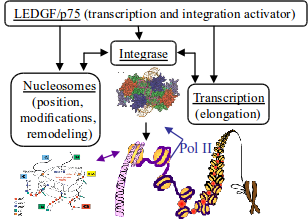 To date, only one cellular parameter, the lens epithelium-derived growth factor (LEDGF/p75), has been clearly demonstrated to be involved in integration selectivity. This protein interacts with both integrase and chromatin and targets integration towards active genes. Two other parameters are very probably involved in the selectivity of integration, the chromatin architecture and the PolII transcriptional process. in vitro concerted integration of the two LTR viral ends into polynucleosome templates depends on the stability, regularity and remodeling of the nucleosomes (Lesbats et al., in press). Our present projects aim to determine the role of chromatin structure, the LEDGF/p75 protein, and the RNA pol II transcription process as regulators of HIV-1 integrase selectivity and the mechanisms of this regulation. Our studies are mainly performed in vitro using enzymatic assays and biophysical tools. Integration assays into various chromatin templates are performed to study the role of nucleosome positioning, remodeling and structural modifications. The interaction between integrase and these chromatin templates is visualized by Atomic Force Microscopy. Finally, transcription is performed in vitro on these chromatin templates and its consequence on integration efficiency and selectivity is studied. The development of our new team and its projects relies on our experience in biochemistry of retroviral integrase and chromatin, coupled with a collaboration with the permanent team of the LJC, specialized in biophysical studies of chromatin. We wish that a better understanding of the mechanisms and structures involved during HIV-1 integration into chromatin, will help to propose new therapeutic treatments, from the identification of anti-viral drugs to the development of new integrases for a safer delivery of gene therapy vectors. Lavigne, M., Francis N.J., King, I.F.G. & Kingston, R.E.K. (2004) Propagation of silencing : Recruitment and repression of naive chromatin in trans by Polycomb repressed chromatin. Molecular Cell. 13, 415-425. Lavigne M, Eskeland R, Azebi S, Saint-André V, Jang SM, Batsché E, Fan HY, Kingston RE, Imhof A, Muchardt C. (2009) Interaction of HP1 and Brg1/Brm with the globular domain of histone H3 is required for HP1-mediated repression. PLoS Genet. 5(12):e1000769. Epub .